while outdoor camping and picnic. Long and large pegs can make your tents safe. - Sturdy enough to avoid being out of shape with hammer. - Special head with hook and hole and the sharp tip of the stake make it easier to use. - Heavy duty material - forged steel - keeps the stake in good condition after long use and out of rust. - Please do not nail the tent spikes vertically to the ground. - Make the stake peg and the ground into a 60-degree angle. - Use the hole to pull out the camping stake. ☀【Heavy Duty Tent Stakes】 Made of high-quality forged S45C steel, fit rocky ground, completely get rid of the snapping and bending problem. 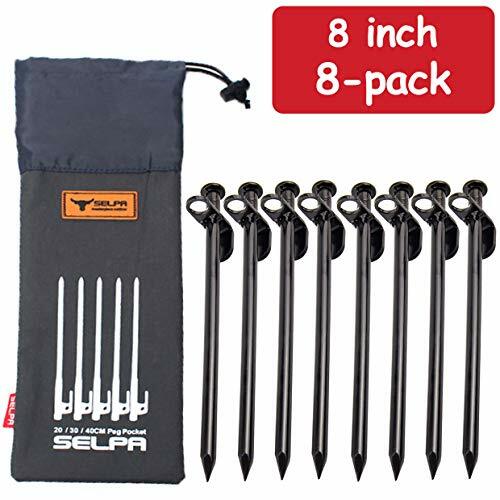 High tensile steel construction makes these tent pegs easy to penetrate the roughest terrain and it is easy to pull out the stake using the hole and the hook on the top. ☀【Multi Use】 Metal steel pegs are suitable for nailing tents, canopies, tarps, and etc. to the ground. Perfect for outdoors camping and backpacking. Long and large tent spikes make sure your camping trip safe in the tents. ☀【Easy to Carry】 8" each, Easy on backpack but long enough to keep your tent secure. And we offer a 600D Oxford Fabric Pouch while supplies lasts. ☀【Package】 Includes 8 pcs peg stakes + 1 Oxford cloth bag. If you have any questions about this product by Merveilleux, contact us by completing and submitting the form below. If you are looking for a specif part number, please include it with your message.